J. Jane Consulting | tierre taylor. toronto, canada. | milliner. dancer. friend. sister. daughter. I can’t help but feel a sense of nostalgia as millions of people celebrate Passover and Easter this weekend. As a young girl, my parents would dress their 2, 4, 6, then eventually 8 children in their Sunday best and march us down Spruce Street to the Holy Rosary Church to celebrate Easter. I would carefully watch women and girls file into the pews wearing their Easter dresses with complementary bonnets and wondered if I would ever be so lucky to own my very own Easter bonnet. They were so fancy! What once was an Easter staple is now rarely seen in modern day churches and synagogues. For years I have dreamed of starting a hat movement. I want women to wear hats every day… not just for holiday celebrations. Enter: Tierre Taylor, the magnificent milliner! Unbelievable. I find it difficult to comprehend that a woman with this much talent does not have the voice to say, “Buy one of my exquisite hats. They will make you feel like an elegant, graceful lady— while bringing back a distinguished style that is truly lacking in our modern day society.” I feel compelled to start a millinery movement. Ms. Taylor’s hats are spectacular-spectacular! And it is my hope that her work inspires women around the world to support the millinery industry. I wish you and your families a beautiful holiday weekend filled with love and laughter. You are a graduate of the Millinery Arts Program at George Brown College in Toronto. Did someone cultivate your passion for hats? 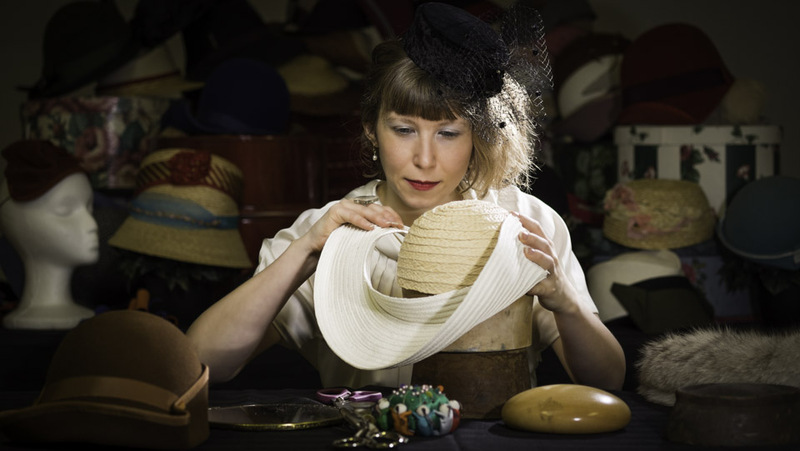 How did you choose to lead the life of a professional hat maker? I actually just stumbled into my passion for millinery. At the time I was doing a variety of Textile Arts such as weaving, felting and sewing. I enjoyed all of these mediums, and yet I still had an interest in taking more classes, as I wasn’t fully satisfied. When I saw the millinery course at George Brown College I was intrigued. I never thought of hat making as an art form. I took the class and to my surprise I fell absolutely in love. After that I made hat after hat with an unquenchable desire to make more. For the first time it felt as if all the things I was dabbling in came together in one complete package. Did you ever feel pressure to follow a more conventional career path? If so, how did you have the courage to stay the course and follow your passion? All of the time! I have asked myself over and over again whether I was crazy to keep going with my millinery dreams. There were moments when I would want to quit and focus on something ‘safer’. I would stop for a couple of days and then I would find myself drifting back towards my needle and thread and before I knew it I was making more hats. I could never truly ‘get away’ as I always feel so much happier when I am engaged in my creativity. I discovered that it is an essential component in me living a happy balanced life. I am an absolute nut for 1920’s era hats. Are you able to duplicate an image if one desired to special order a dream hat to be worn year around, not just for special occasions? The 20’s were an amazing time for hats. Millinery was alive and flourishing. I could definitely take an image and get a close duplication. Of course with every piece it’s an individual handmade item, which means there will be characteristics unique to that particular hat. Plus materials have changed a little since the 20’s, so there would have to be some improvisation. I can honestly say that it is really fun to take shapes and styles from the past and to bring them into the modern day. My greatest obstacle has been feeling that what I love to do is worthy of sharing with the world. I worry that my interest in fashion and beauty is too superficial, that maybe there is something more important I should be focusing on. It has been hard for me to see that the love and devotion that I pour into my hats is a worthy pursuit. This is something I continue to face. How I navigate it… by reminding myself that ‘Beauty’ is an expansive experience, one that invokes joy and connection with something deep inside of us. When gazing at a flower or watching the reflection of the moon dance upon the waves of the ocean, my mind stills and I am in awe. It then makes sense to me that it’s a natural desire to want to emulate this, to ‘beautify’ oneself. It’s an essential part of our self-creation, our authentic expression, as we too have the power to inspire awe in those that gaze upon us. Who should consider a millinery career and what steps should a person take to follow in your footsteps? A hat lover of course! Someone who loves to work sculpturally with their hands; who enjoys hand stitching, fine materials, design and fashion. I would encourage taking some courses with a milliner that catches your eye. Often they will do short-term intensive programs and it’s perfect to get you started. You may have to travel but it’s worth it. Continue to take steps in the pursuit of your dreams even if it frightens you down to the bones. You will surprise yourself along the way! It’s truly amazing. Give yourself space. Space to breathe, to dance, to create, to dream, to read, whatever brings you a feeling of lightness and ease. Life can be so busy that it’s important to create pauses designed for renewal in both body and mind. Be sure to visit the Humans of New York Post with Tierre Taylor and if you are looking for that perfect gift to give yourself, visit Tierre Taylor -Couture Millinery. Also, if you feel moved to do so, you may connect with Tierre Taylor on Instagram, Pinterest and Facebook. This fabulous photograph of Ms. Taylor was taken by Al Smith. Love the story and love hats, too. Oh how I do wish hats would make a come back. I would love to help you in your ‘hat movement’. Happy Easter/Passover to you and yours.